Testimonials can be very powerful for helping to establish trust and encouraging visitors to buy, sign up, fill out a form, or take whatever action you are after. For websites and online businesses testimonials can be even more useful than traditional businesses because visitors are often skeptical or hesitant to trust someone online. Website testimonials can be displayed in different ways, and we'll take a look at more than 15 examples in this post. Hopefully these examples will give you some ideas that can be useful for your own projects. Here you'll find some that use video, photos of customers, quotes from reviews, and more. Desk's homepage includes a testimonial in large text with a the customer's logo. The Resumator's homepage includes an area right in the middle to feature testimonials and quotes from reviews. PSD2HTML's website includes testimonials on their "Work" page that shows customer reviews. Doteasy's homepage includes a customer testimonial with the option to view more testimonials. The Pricing/Join page of ElegantThemes includes an area after the pricing options with an option to view more testimonials. 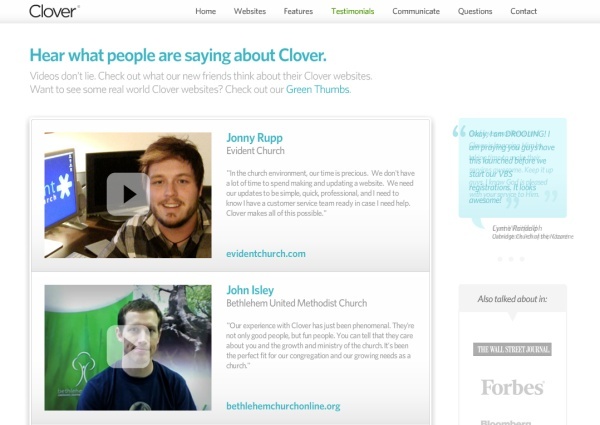 Clover uses a testimonial page and they display several video testimonials from their users. Themefuse includes a customer testimonial near the bottom of the homepage. On the left of the testimonial, there is an option to view a few more. WPZoom's homepage includes a few testimonials from happy towards the bottom of the page. Campaign Monitor has a page dedicated to case studies, which are just like more detailed testimonials. The BuySellAds homepage is split in half to separate content for its two core audiences, publishers and advertisers. Each page includes a testimonial from a customer. The StudioPress homepage rotates through testimonials, with photos, from people who are highly influential in the WordPress and blogging community. The Social Agency's homepage displays testimonials in prime position in the slider. Subernova's homepage shows quotes from several reviews, and in some cases links to those reviews. FreeAgent's buzz page includes a video testimonial and several other brief text testimonials. 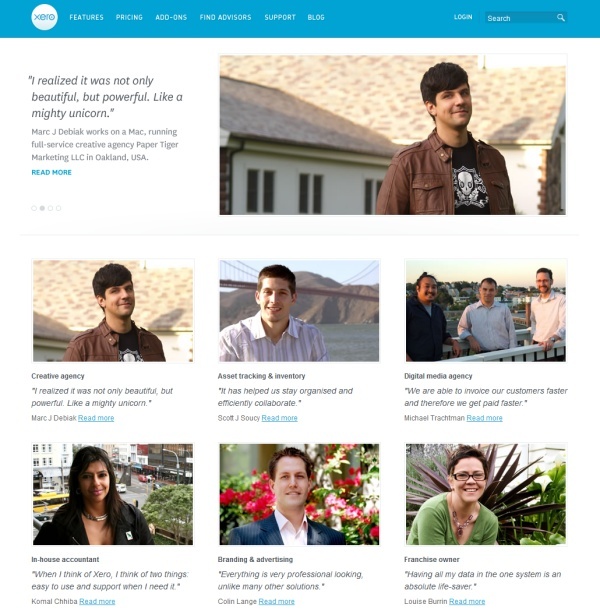 Xero's customers page includes several testimonials with links to more detailed case studies. The Business Catalyst homepage shows several testimonials, listed as "partner stories", with photos. Each one includes a link to a more detailed case study. Free video clips from Bigstock! Get up to 35 clips in a week. Looking for hosting? WPEngine offers secure managed WordPress hosting. You'll get expert WordPress support, automatic backups, and caching for fast page loads. Editor-in-chief of Vandelay Design. Part time web developer, blogger, and dog walker. I enjoy Seinfeld, running, camping, and jelly donuts. I'm always learning and I love to help! Feel free to drop me a line and say hi or follow me on Twitter or Google +. Ally Lennon, October 24, 2011We recently finished redesigning our site, and this article has me kicking myself- of course should have the testimonials right on the home page, rather than an interior page as we did. Luckily shouldn't be too big a drama to remedy- V5.5 here we go.. Anyway thanks for pointing out what should have been obvious to me in the first place. Web Design Calgary, October 24, 2011These are some great examples. Thanks. An often missed concept for new business website owners is that the act of giving testimonials to others, can increase inbound links to your own site. Dan, October 25, 2011Great examples here, love seeing what others are doing in their designs. Ryan Leaper, October 25, 2011Testimonials can be a very effective element to a website not only in terms of decoration but for helping create trust for the user. I think it's an often overlooked element but as these examples show they can really enhance a sites design as well as improve the selling potential of a website. The use of photographs accompanying the text I think works really well and helps add a personal touch to the testimonials as well. I particularly like the Clover site, the videos accompanying the testimonials is a nice touch. Kevin, October 26, 2011I have done some great things with testimonials my self. 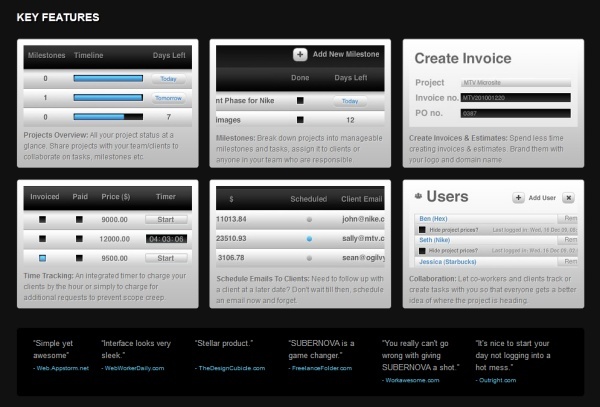 I have mini js slider allows testimonials cycle through randomly.Kinda like Xero actually. Hugh Caraway, October 26, 2011Thank you! I can guarantee that about 80% of my small business clients ask for a testimonial page. It is good to see that a lot of WordPress themes are starting to include Testimonial shortcodes, templates, or plugins. However, you can only format it the same way so many times. Thanks for the inspiration. Swamykant, October 27, 2011Testimonials matter alot. You have present great examples here. I will surely to follow some of this for sites. Kaisho, November 3, 2011Love the examples, I'll be adding them to my own sites.Thanks for posting this. Craig Smith, June 30, 2012Good samples here. I prefer the dynamic or jquery type testimonials, more interactive I guess. But good samples here non the less. Sandra, March 8, 2013I was looking for inspiration to create my own testimonial page and this post was of great help. Thanks a lot!